No matter where you see yourself working as an engineer, Spirit Studios will give you the freedom to explore a range of technical areas, and gain professional skills in audio engineering throughout our Music Production & Sound Engineering course. We have developed these modules in stages to provide you with a clear progression route during your study. However, depending on your experience in the subject area, it is possible to begin your study at different stages. Designed to teach you the fundamentals of music production, and engineering in the studio, this module will cover everything from sound wave theory and microphone techniques right through to multi-tracking, editing and professional mixing techniques in both Pro Tools and Logic Pro X. Whether you have no experience in the studio, or you’ve done some studio recording in the past, this course is the perfect way to build up your skills, improve your knowledge and take your first steps as a professional engineer. 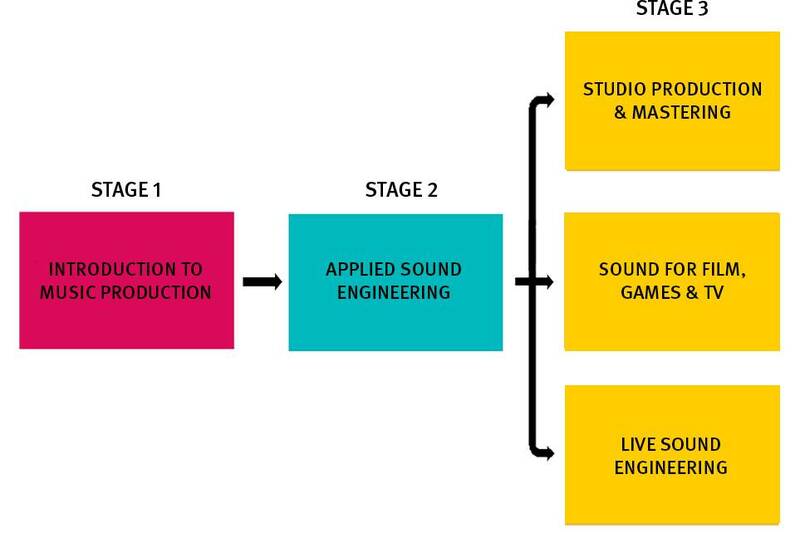 Taking your production skills to the next level, you will have access to a range of more advanced studios, and really get a feel for the various different aspects of sound engineering. Opening you up to the range of career paths that are available to you, this module will introduce you to live sound engineering and audio post production, allowing you to gain practical experience working with both analogue and digital mixing consoles, while building on your overall production skills and achieving your Pro Tools 110 certification. And sound effects and Foley recording. This is where you can put your critical ear to the test, and challenge yourself as an engineer in our most advanced studios. Working to more challenging briefs, you will be able to perfect your recording and mixing techniques while developing new skills in mastering. Through this module you will learn to produce work to the highest commercial standard, across a range of genres, while gaining insights into life in the industry, and advice on how to achieve your goals as a professional engineer. And copyright, marketing, and PRS. Building on the knowledge you gained in audio post production, while studying Applied Sound Engineering, this module will challenge you with mixing soundscapes, recording voice-overs and designing sound effects, working to industry standards at all times in our purpose build sound-design studios. Giving you the freedom to apply these skills to a variety of different media, you will have the opportunity here to gain professional skills in post-production, while also gaining an industry-recognized certification in Pro Tools 210P. Working in our on-site live venue, throughout this module you will gain a much deeper understanding, and extensive practical experience in a number of different areas within live sound engineering. From PA design and mains distribution, to live recording, processing and effects, with expert guidance you will build on your previous experience in live sound, and develop your skills to a professional standard. And with the variety of events requiring live sound engineers, you will learn how to apply these skills to everything from small underground venues as well as larger scale events, while gaining a British Safety Council Health & Safety Level 2 qualification and learning how to take your next steps as a freelance engineer. Qualification Spirit Studios Industry or Advanced Diploma, Pro Tools 101, 110, 201, 210P, Apple Certified Pro - Logic Pro X (£ optional). All qualifications dependent on your choice of modules. Hours of Study 6 hours of delivery per week plus studio time. Days and times dependent on chosen modules. Please contact us for info. From £1890. Dependent on choice of modules. Instalment options available.